Many people will recall Ray Denton, who started making narrow boats and Dutch barge hulls almost 30 years ago, trading as R&D Fabrications. His hulls are well known for their quality throughout boating circles. 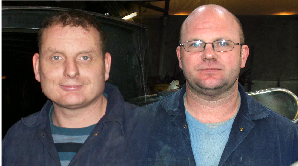 Although Ray sold the business in 2002, two of his original employees, Garry Summerfield and Lee Wolosiuk kept the R&D tradition going. The two partners, whose combined experience in this field totals some 30 years are now trading as XR&D Boat Builders, and still designing and fabricating high quality narrow boats and Dutch barge hulls from the same premisies in North Nottinghamshire.